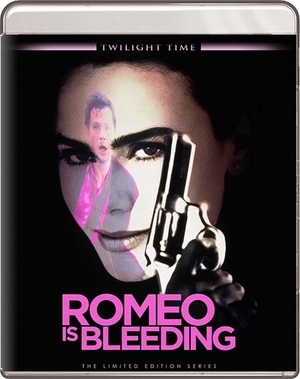 To me this is a perfect choice for a Twilight Time Special Edition Blu-ray. This is one of the most underrated films out there. I absolutely love this movie. I have seen it so many times and it is always a treat to revisit it again. Now on a lovely high quality Blu-ray that Twilight Time has specialized it giving this overlooked gem a new and worthy product. Yes the movie has it's flaws but I feel that the over all story, thick characters, and Neo-Noir darkness, makes this film stand out. Starring one of my all-time favorite actors Gary Oldman. Oldman is one those actors that to me is a priceless performer that never fails in creating characters that so out there, or so memorable that you the viewer can’t help but praise him. From 1987’s Prick Up your Ears, 1992’s awesome performance in Bram Stoker’s Dracula and to my all-time favorite performance by him 1994’s Masterpiece Leon: The Professional and so many others. He is a master actor that I praise 100 percent. Also starring one of the beautiful goddesses of cinema Lena Olin. She aces her part in this film and is a character to always remember. Her alongside Oldman is just plain priceless. The movie was critically hated, but Lena and Oldman was praised. I personal think this film is hugely underappreciated and has a perfect dark atmosphere to storytelling. Also starring the wonderful Juliete Lewis, always a treat to see. Also the one of kind Roy Scheider, I still can’t believe he is no longer with us. The whole movie has an amazing flawless cast to it. This also stars an actor that I have always believed has never gotten the lime light he deserves. He is a constant performer of excellence. A tough guy, or bad guy persona, cop, just a unique and multi-talented performer I speak of non-other than Will Patton. Patton is a golden ticket when it comes to acting. The characters he plays in films are always displayed flawless to the point he can get under your skin and bring out the nerves to a boiling and that’s true quality in acting, bringing out an emotional response in the viewer. The plot to the film is very straight forward but very complex in character and action. This is a true neo-noir reality that is done in a modern beauty of violence, but yet takes from all the classic's of Noir films of the past. Your main character Jack is a corrupt cop that works with the mafia and is paid for his deeds. Now Jack has a loving wife Natalie who is played flawless by the very beautiful and talented Annabella Sciorra. Now he has a fling on the side, a mistress. His world is grand, that is until enter a Russian female mob assassin, both psychotic and clever. Directed by Peter Medak. Medak will always be praised by me for he directed one of my favorite horror films of all time. One of the best ghost stories ever created. 1980’s The Changeling starring the masterpiece worthy actor George C. Scott. Medak has away with breathing life into his pictures and making them form a reality around the viewer watching. Romeo is Bleeding is a prime example of that reality. His characters on screen are so well displayed that there is an underlining everyday reality to them. His direction is often dark and thick, and yet displays itself in a humanly aura of belief. Twilight Time did another amazing job in picking a film that I feel is overlooked and pushed away. This had amazing performances and a classic style of Noir that runs through its veins. It has a beating heart of violence and a no holds bar intensity of story and complex unique characters. Twilight Time never really fails when it comes to an amazing transfer. Solid sound quality. Crisp vibrant imagery. The film has never looked any better. I have seen this movie countless times, on VHS or TV and even DVD, but the quality on this Blu-ray is amazing. The dark tones are perfect, and the imagery displays itself in a new fresh reality. Sadly, slim pickings on the extras. But the movie itself in 1080p High Definition is an extra all in itself. Isolated Score Track (with some effects). Man behind the music has been a part of many movie soundtracks. Well over 100 films. Just to name a few, 1986’s The Hitcher, 1991’s Point Break, 1992’s A River Runs Through It, and so many countless others. His passion shines in his music. His music ability of Jazz, electronic or classical reality just becomes a part of the many films that he has left his stamp of sound on. Yes, again I have no complaint on this perfect transfer to 1080p. Twilight Time chose a film worthy to praise. So many put this film down or pick it a part and I don’t understand way, I think it’s a brilliant Neo-Noir flick of Bad guys and worse style of characters. The performances are spot on. The direction I feel works. In the end I feel it’s a movie that is worthy to praise because of its many qualities, and Twilight Time has done this film justice.